Union Green is about to launch, an incredible $120 million 150 unit landmark apartment block on the edge of Auckland’s CBD. 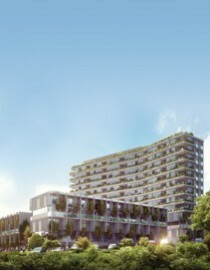 Rather than go for a maximum allowable density of three apartment towers, Myland Partners have opted for a mix of apartments and terrace homes with just one apartment tower. Instead of a maximum of 240 units, only 150 will be built, giving residents open spaces, better views and outlook on a site that’s optimised for sunshine. Apartments will be available from $425,000 and terrace homes will start at $650,000. To get a sense of the views available and the fittings used and layouts available, visit our Display Suite. It’s open from 2pm-4pm, 7 days a week, at 39 Union Street.